Jens Gustavsson developed it. Should be solid. I ran a hy35cw for a few years without many issues. Going to a custom manifold picked me up around 30whp over the 90+ on the same turbo tho. Aren't you running the same turbo Wilford ? Who in their right mind would even steal such a thing?!? Ahh the ol steal the turbo and manifold trick. Dump the manifold in the garbage just to spite you. That sux dude. I think we need a minute moment of silence for the lost boost. Just get a new top mount header. I just made the downpipe for my hx35 today and although it wasn't bad, I don't want to do it again. The 8v extreme header has a flange for 40 mm waste gate. So on top of building a new down pipe, you would have to buy the appropriate waste gate for header. I got this one. Beefy as sheet. Real thick. I think I paid $525 for it. I got it from Lord Athlon. It's new still, never been on a car and run. No waste gate hole to plug. You don't have to run a external waste gate, you can just plug the hole with a block off plate or v-band plate if you buy one that has external gate hole. Last edited by sbabbs; 04-12-2018 at 07:25 PM.. Doesn't the "extreme t3" require the alternator to be moved? On a 240 yeah. In a 740 it's the PS pump that needs to be relocated. Knowing Ryan, it likely has no PS to speak of. 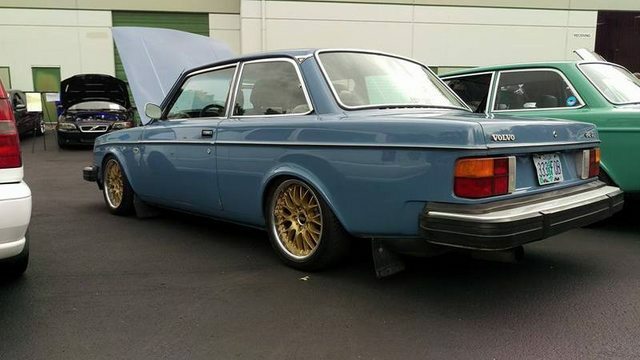 The only extreme t3 I could find..
1980 242 DL, B230FT, big turbo. 2005 Chevrolet Duramax, LLY, CC, even bigger turbo. Same one KL sells, just his site is in English proper. Ha.